We are having a record high February warm-up here in Vermont, with highs in the 60s today. The ducks are having a blast and are so excited to have actual water to play in. It will still be a month or two before we start warming up for good, but at least for today the ducks are very happy to enjoy this while it lasts. We picked up six baby chicks on Saturday. These are supposed to be females and will get some new blood into our laying flock. Trying a couple of new breeds as well. Not much of a winter so far here in Vermont. A bit more snow than where we used to live in Chicago, who just had the first January and February with no measurable snow for the first time in a long time. But still a fairly mild winter. It’s been brutally cold the last few days though, so winter is not done yet. Anyway, seed starting is well underway. Still trying to fine tune my basement seed starting setup, which in this case mainly means adding a few more lights. Otherwise I’m pretty happy with my current setup. Starting a few things a bit earlier than last year now that I have a better understanding of when and how the greenhouse plays into the mix. 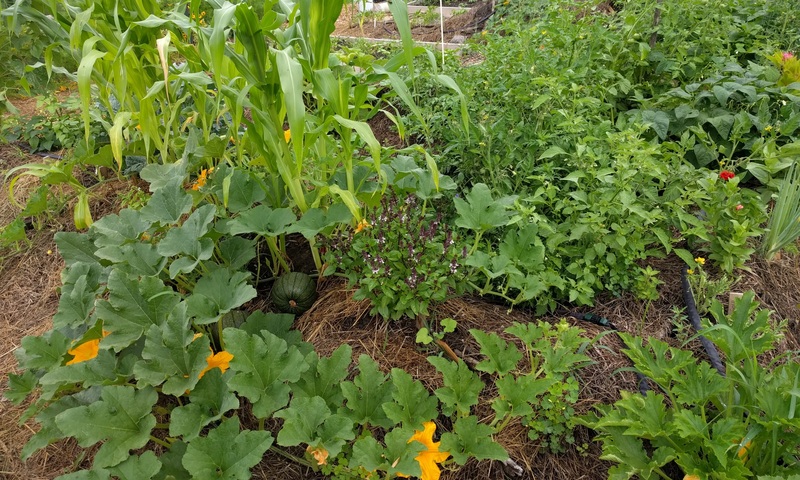 Basically thinking I can get even bigger and better starts than last year and potentially get stuff into the ground sooner. This year we are going to experiment with going no-till for a bunch of reasons. After research and talking to some people who know more than me, I would just like to get away from using the tiller for anything except maybe establishing new plots. Tilling does a major destruction on soil structure and biology and basically stirs up a bunch of your nitrogen to the surface where you basically lose most of it. The other thing we’ve found is that we end up fighting weeds in the aisles by mid-summer, which is both a waste of time and takes energy away from the plants we want. Makes more sense to develop a deep mulch structure and use carbon (newspaper, cardboard) between the rows. 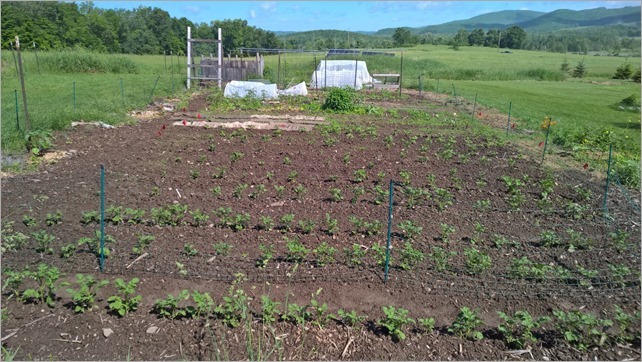 Eventually you get a much richer, deeper soil structure with a lot of bio-diversity plus help from the mycorrhiza fungi network and the soil structure makes it much easier to pull the weeds that do germinate. That’s the theory anyway and we’re going to experiment with it. 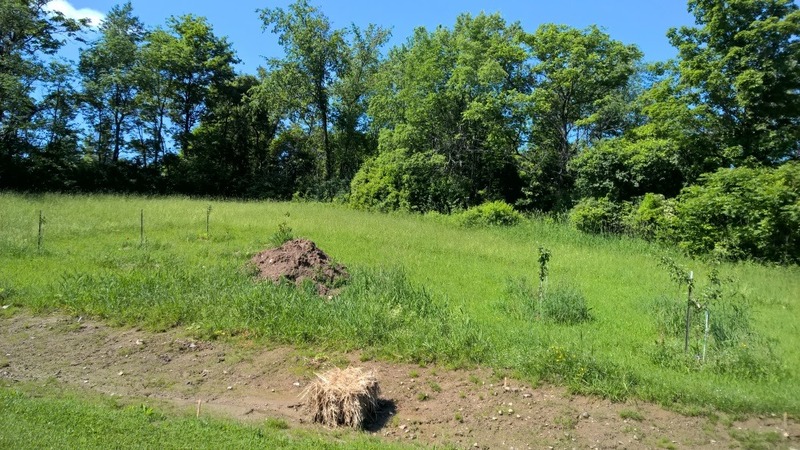 What we are doing now is too much work and we aren’t building soil fertility as fast as we want, so time to shake things up. In other news, our lazy chickens (and one of the ducks) just FINALLY started laying again after taking a break since mid-December. And not all of them have started yet. That’s a lot of freeloading. Fine with them having a month or so break, but this has been too long. That being said, our youngest birds are about 2 years old, so not that surprising that egg production is slowing. We’re going to add some new hens to the mix this spring. Before long it will be time to start putting cold hardy seeds in the ground, like lettuce, carrots, brassicas and peas. And maybe even some potatoes if we can get into the ground. The long range forecast isn’t showing a lot of frost after the end of March, so it will be interesting to see if we can get an earlier start this year. In Vermont every day helps. 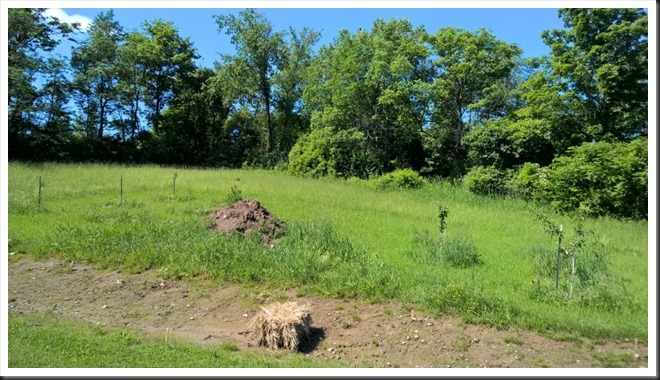 Here’s just a few shots of what’s going on with our gardens and rest of the property near the beginning of June. We had a mild spring that wasn’t too wet and actually got very hot towards the end of May. Just had a nice rainy day yesterday after about a week without, so everything is pretty happy at the moment. Here’s the back garden in a couple of wide shots. Those are potatoes in the foreground. A shot from the front to show off some flowers already blooming. Hops are already going nuts. These poles are about 15-20’ at the top. Here’s the front garden. Look how big the garlic is already. It’s pretty happy this year. By the way, all the green is partially due to the cover crop of buckwheat that we are leaving in place for now between rows and where we haven’t planted yet. A bit of an experiment and in some ways makes it harder to see the rows, but hoping the benefits make it worthwhile. Here’s the orchard. A couple of the initial plantings are finally starting to show some growth. Here’s a similar shot from around the same time last year. Notice how much we filled in the middle section this spring. And finally, another shot of the ducks at 6 weeks just for fun. They are now outside in their permanent spot, although not free ranging yet. Starting note: I know I’ve been negligent at updating this site lately, but hoping to get back into it. Lot’s of stuff going on at the homestead. We are finally expanding our menagerie of animals here beyond chickens. We actually planned to get ducks last year and then never got to it. 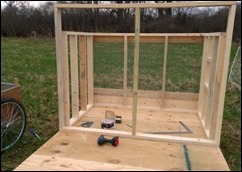 I had a duck coop already built a year or so ago. 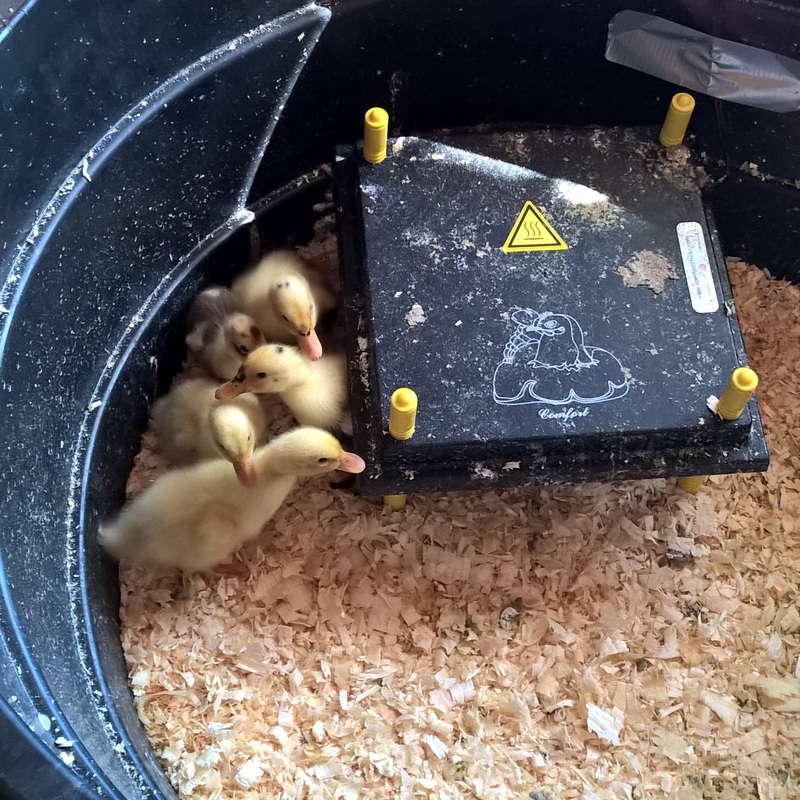 Last Saturday we picked up six day old Ancona ducklings from a local breeder. Ancona ducks are considered Critical on The Livestock Conservancy breed list and we are fortunate to have some breeders here in Vermont trying to grow the breed numbers. I’m still not sure how many we’ll end up raising, although the idea of breeding a critical breed is intriguing to me. For now we will end up keeping one drake and all the females from this group of 6. The other drakes will end up being delicious dinner at some point. Seems counter intuitive, but part of building a breed is finding more people to raise them for typical use (eggs, meat, pest control, etc.). Here they are at almost a week old. Growing insanely fast already. This spring we decided to try to hatch some of our own eggs since it turned out we had a rooster. 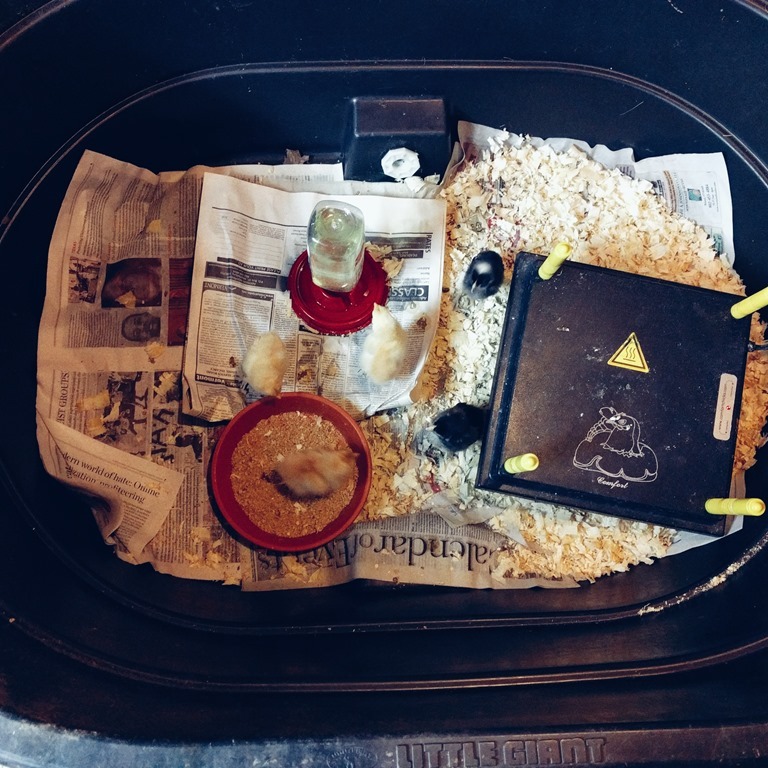 Looks like we’ll end up with 9 chicks out of 16 eggs, which isn’t too bad. We might have gotten a couple more, but we had a power outage of all times right on hatch day. It was only for about 40 minutes, so I think the humidity stayed okay, but the temp might have dropped a bit too much. Can’t tell for sure. Could also be those chicks just weren’t viable to begin with. What I didn’t realize with our Cuckoo Maran rooster is that all the chicks will have some bar/cuckoo patterning, so it’s going to be very hard to tell them apart. Hopefully as they get older and get their true feathers, there will be some distinctions. But we definitely didn’t get any of the stereotypical fuzzy yellow chicks. I still think they are really cool looking though. 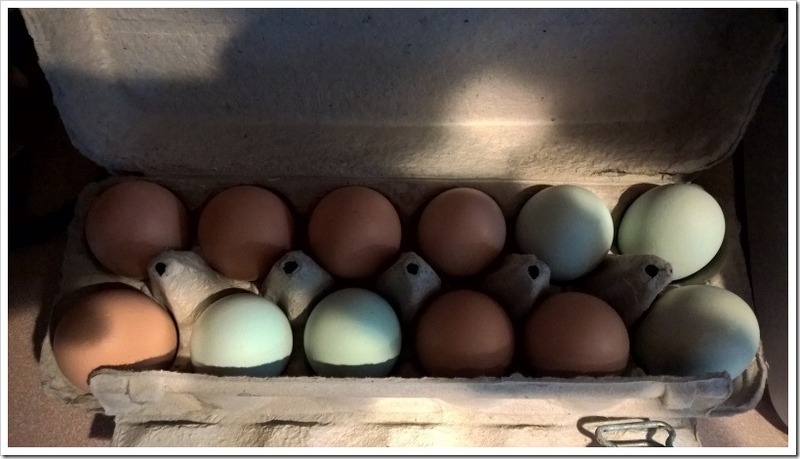 We are hoping to get at least one or two “Olive Egger” hens out of this, since we crossed the Maran (which has dark brown eggs) with our three blue egg layers (two Araucana, 1 Lavender Ameraucana). That cross should give us some type of dark green egg. As far as the roosters, we’ll probably throw them out on pasture and then they will be headed for freezer vacation. In the meantime I need to learn how to butcher my own chickens from someone around here. After a long winter with little egg production, things are finally looking up. Some of our new hens never came “online” last fall and ended up waiting until this year. But since Wednesday morning, we’ve gotten 17 eggs including 2 already today. That’s from 9 hens. Based on the color of the eggs, it looks like at least 6 hens are laying some of the time. Well, between keeping up with all the projects and having a new baby, this blog has taken a bit of a hit. So this post won’t be too lengthy, but wanted to do a quick bullet point list of stuff we managed to accomplish this year. Built a brand new chicken coop based on Fresh Air Poultry Houses, large enough for 15 chickens or so. Lost one of our original hens, but picked up 6 new ones. 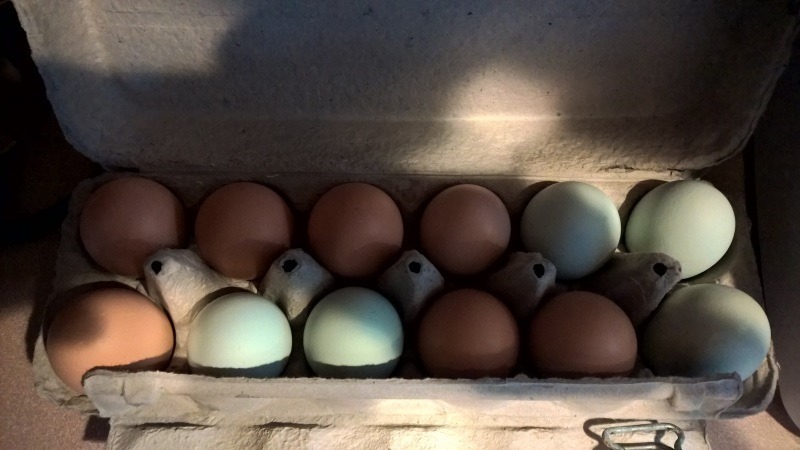 Got our first blue eggs. One of the 6 new “hens” turned out to be a rooster (the Cuckoo Maran). He is still on probation until we determine if he’s going to be nice and helpful or a pain. Built a duck coop and planned to get ducks, but that didn’t happen this year. Hopefully next year. 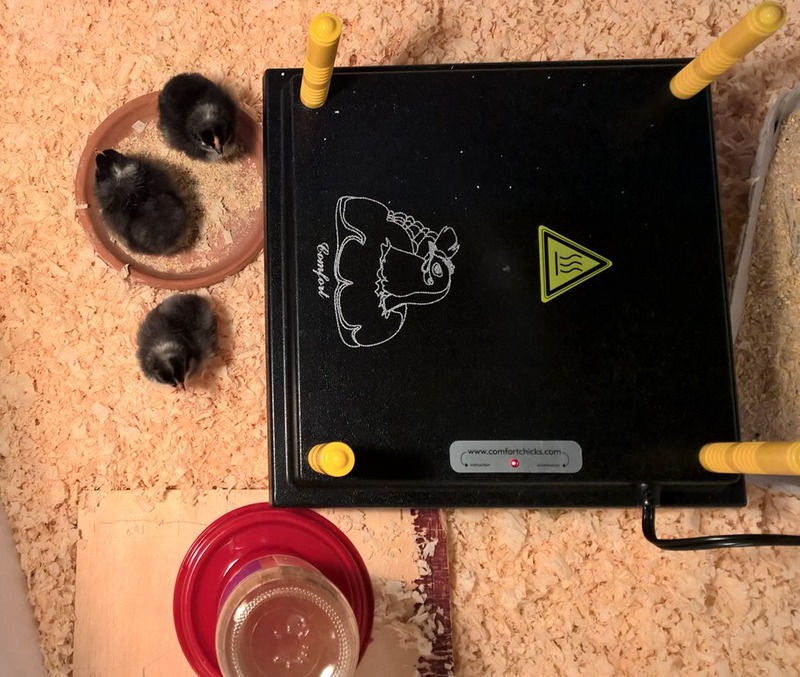 Set up solar for the new coop, which I still hope to blog about at some point. It’s struggling a bit now with the limited daylight and snow/ice, but I think overall will work well for lighting. Would eventually like an automatic door as well. Put in 2 brand new garden plots. They did okay considering it was the first year, although we still have a lot of soil consistency and wetness issues to work on. 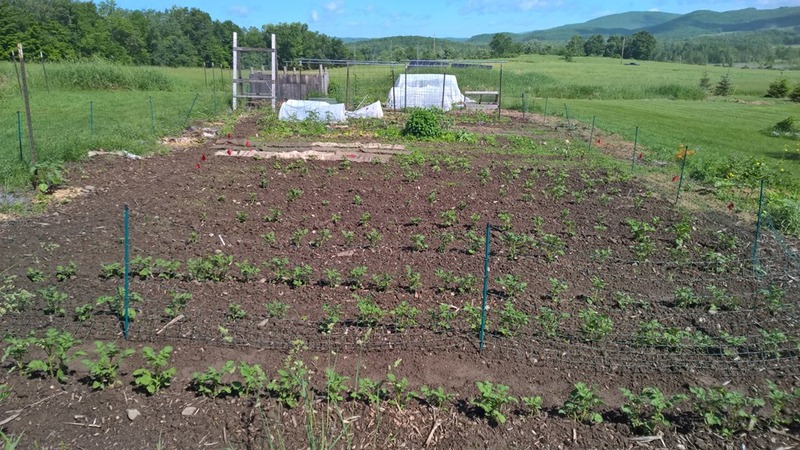 Started 4 blueberry bushes, 25 asparagus crowns (of which about half made it) and 75 strawberry plants (3 different varieties of 25 each). Flowers – we had decent luck with various flowers this year, including sunflowers, that we’ve struggled with before. Still can’t seem to get Brussels Sprouts to work. Our cucumbers and squashes mostly succumbed to a vicious onslaught of insects. Need to do a bit more row cover and other stuff next year. Got a riding mower and shed to store it in. Had a full landscape design done that we are really excited about implementing over the next 5-10 years. Lots of plans for next year that I may get into in another post. Soon it will be time to buy and start seeds. By the way, if you are thinking about seeds, don’t forget about my new site PickAPacket.com and tell your friends. 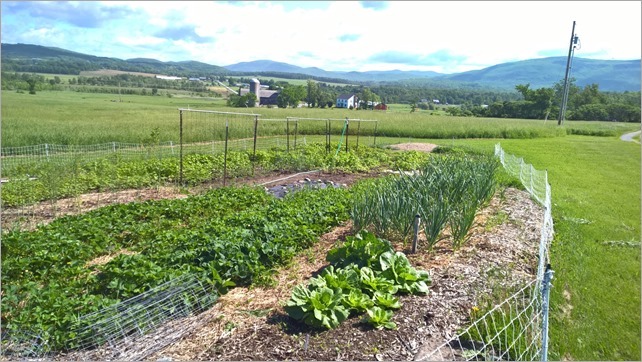 It allows you to compare prices and see varieties carried by 13 of my favorite non-GMO seed companies, including lots of heirloom, organic and open-pollinated varieties. After a long winter, it’s finally trying to become spring in Vermont. I ended the winter and started spring with a laundry list of projects, since this will be our first spring on the new property. 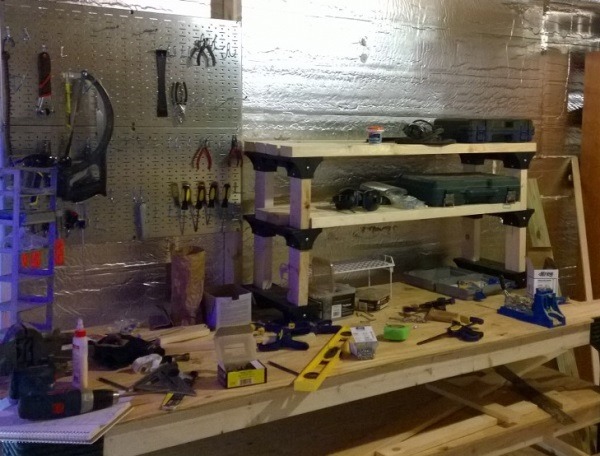 Fortunately we have a rather large unfinished basement, so I was able to set up a workbench down there and have some room to put together some things. We decided we want a few ducks and while some people have good luck just keeping chickens and ducks together, I would prefer not to do that. 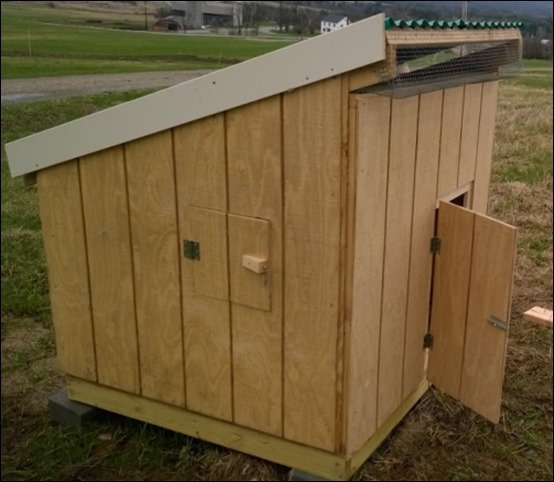 Ducks are a lot messier from a water perspective than chickens, so I decided to build a simple coop for ducks. We hope to get a few sometime this summer. 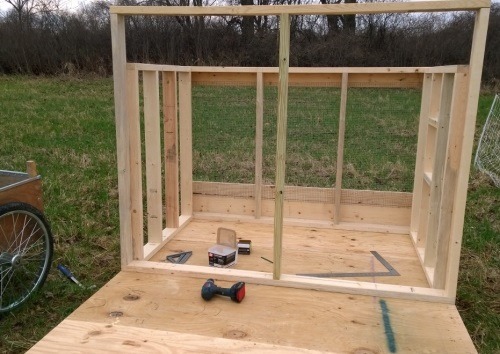 It’s a pretty basic little shed-type structure. It’s mostly there except I do want to paint it and still need to do some predator proofing. We’ve had our 4 chickens for a couple of years now and have decided we need a few more to really keep us in eggs. The coop I built has worked well, but it is really maxed out at 4 hens. 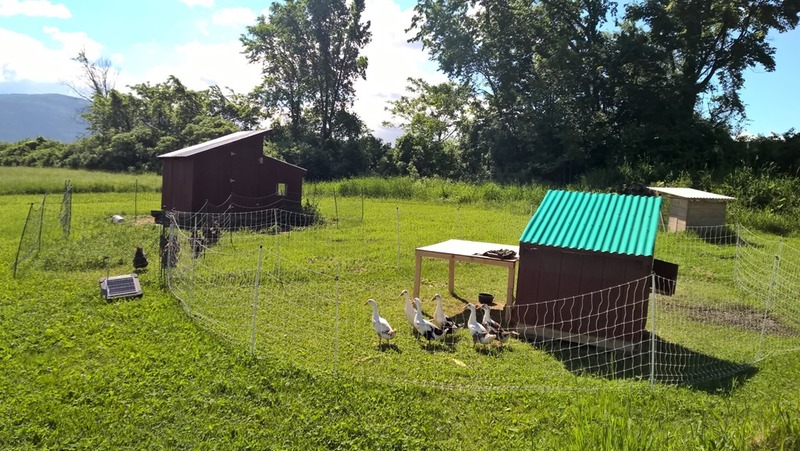 So I decided to build a small version of one of the open air concepts from Fresh-Air Poultry Houses: The Classic Guide to Open-Front Chicken Coops for Healthier Poultry . 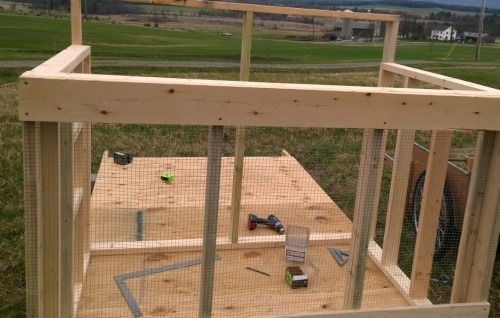 This coop should hold up to about 12-15 hens, although we’ll probably just move up to 8 or so initially. I’ve been building the stud walls in the basement and I’m starting to put it together outside now that the weather is getting nicer. Here’s where that is at right now. The design is interesting and will make more sense when you can see the whole picture. Another smaller project is a simple bed for Ezra. He’s not quite ready for one yet, but it won’t be long. I decided to use these easy plans from Ana White, who has a lot of great DIY furniture ideas on her site. The finish is going to be this interesting idea I’ve seen a number of folks mention online, which involves using steel wool partially dissolved in vinegar. This basically reacts with the tannins in the wood, giving you kind of a distressed, old furniture look which gives 2×4 dimensional lumber more character than you would expect. I’ll finish it with tung oil mixed with citrus solvent, which is another cool more natural way to finish stuff. Interesting to see how it turns out. 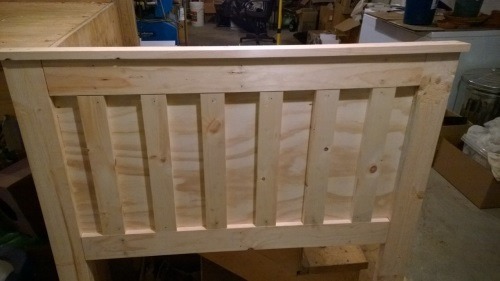 Here’s the headboard without the finish. More pics of this stuff when they are finished. 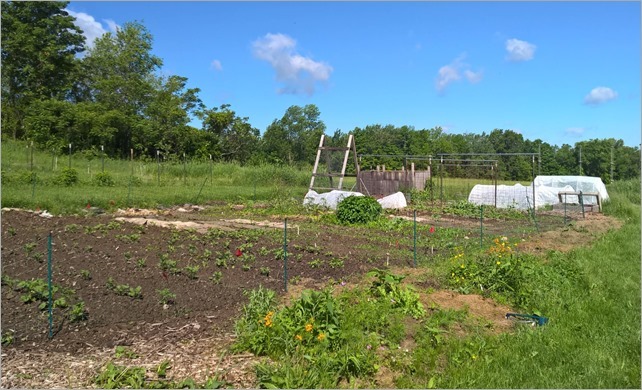 In additional to these projects, we’re also trying to prep 2 fairly large plots, one for vegetable garden and one for more perennial-type items, such as strawberries, blueberries, asparagus and rhubarb. 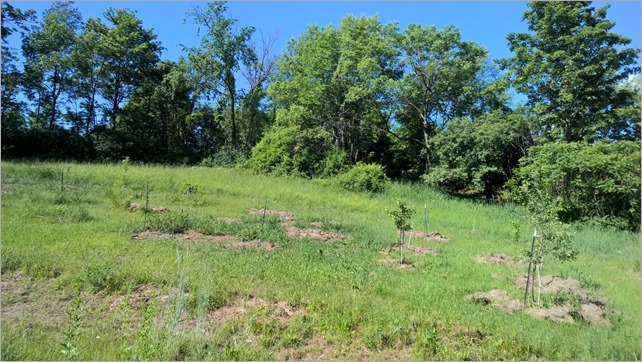 Our property is extremely wet, with a couple of fairly consistent flows of water running through several sections of the property. When we had our first big snow melt, it actually started washing out our lane and we had to get some emergency repairs done. So it’s been a bit frustrating waiting for things to dry up since I also need to put up a clothesline and would like to build Ezra a sandbox. And of course all the things we want to plant. Fortunately we do have 3 raised beds going now, so we can get some things planted and we’ll just have to get a late start on some things this year. There is only so much you can do the first year. The chickens have enjoyed pecking around in an inch or two of snow, but this latest storm seems to have them a bit confused and tentative. No wonder, a couple of feet is a lot more snow. It’s fun to see their different colors contrasted against the snow though.